Curt Schilling walked into the media room at Citizens Bank Park and smirked before finding a folding chair and plopping himself down. Moments earlier, he walked off the field as the club celebrated the 25th anniversary of the 1993 squad that reached the World Series. "So, who's running this thing?" Schilling quipped in a sarcastic tone. 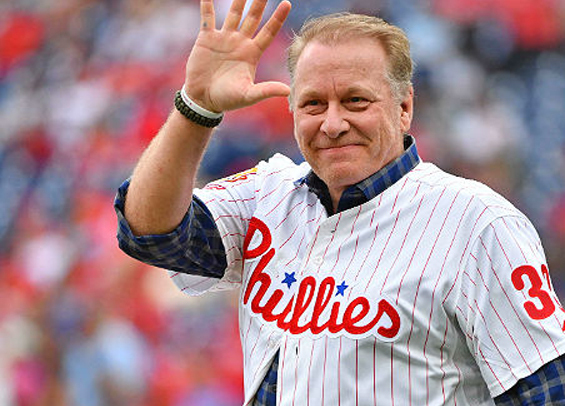 Schilling was one of more than a dozen players on hand in early June as the Phillies celebrated the '93 club, a team that won the hearts of Philadelphia just as much for its irreverence as its play on the field. As Schilling spoke his former teammates left the room, leaving the media spotlight to the ace that won 16 games that year for a team that few felt would do anything more than finish outside of the bottom of the division. Unfortunately, every contributor to that '93 squad wasn't in attendance for the celebration. Darren Daulton passed away last summer after a bout with cancer and several coaches have since passed, including skipper Jim Fregosi. Mitch Williams declined the club's invitation and Lenny Dykstra, one of the leaders of the '93 club, wasn't invited because of his brushes with the law, including an arrest earlier this year in Linden, New Jersey that resulted in charges of making terroristic threats and drug possession. Schilling spent nine seasons in Philadelphia and eventually went on to win three World Series rings, one with Arizona and two with Boston. He's arguably the best pitcher on the current Hall of Fame ballot not yet in Cooperstown. "I don't think I have a career in the big leagues if I don't come here and meet [pitching coach] Johnny Podres," Schilling said. "A lot of the things that I might have been known for as a player, their roots were here. I lost my father in '88 and I was desperately seeking some male role models, and [former bench coach] John Vukovich and Johnny Podres were those guys." Ironically, Schilling was teammates with now Phillies manager Gabe Kapler in Boston back in 2004. The two have stayed in touch and exchange the occasional text. "He was a great teammate," Schilling said. "A phenomenal teammate, a consummate teammate, a workaholic. I've been texting him all year, just been in his ear a little bit, trying to find out from my side what it's like, what he's going through and stuff like that. The thing I told people after Opening Day, I was laughing because I'm a pitcher. So I was offended when he was taking his pitcher out after five or six innings. But he's not going to make the same mistakes twice. I think that's a huge thing. He's accountable. "There's some [Terry] Francona in him. Terry used to say, 'You're fired the day you're hired.' They just don't put that date on your contract. So if you know that going in, you do things your way, which I think Kap is doing. He's a sponge. He's always looking for something different and something new. He's very much on the analytics side of everything and I think he'll find that middle ground at some point, where every decision won't be based on exactly what the numbers tell you what you should do in this situation, because there's a gut feel to it and I think it takes time." The 1993 NLCS began on October 6, 1993 with Schilling tossing eight innings in a 10-inning 4-3 win over the Braves at Veterans Stadium. Mitch Williams notched the win, but only after allowing the visitors to even the contest in the ninth with Bill Pecota crossing the plate on an Otis Nixon groundout to short. Kim Batiste drove in the game-winner for the Phillies, driving in John Kruk from second with a double to left field. Schilling went on to start another game in the NLCS and finished with a 1.69 ERA over 16 innings. "We were clicking on all cylinders at that point," Schilling said.